As the exam season approaches, so do the anxiety and stress levels amongst the student community. With the exam dates drawing near, a tense environment builds up in the households of the exam-going students. For the majority, exams are a hassle. Dread arises, due to the burden of cramming information, remembering that information, and for some, simply the fear of being evaluated and compared. With growing competition, one commonly associates the word “STRESS” with exam time. What is stress and how do I overcome it? This is a common question that keeps coming to everyone’s mind. To begin with, stress, if in the right amount, can give us the drive to achieve our goal. However, when the amount of stress, as well as the way it is approached, go haywire, a problem arises. An anxious state of mind develops, leading to irritability, anger outbursts and inability to concentrate. There are certain warning signs that one needs to be aware of, which indicate that the stress level has hit the danger mark. Disturbance of sleep: The first biological process to go awry is the sleep cycle. Many develop difficulty in initiating and/or sustaining sleep. For some, despite having a sufficient quantity of sleep, they can still wake up tired. This causes fatigue, unexplained muscle pain and body ache. Loss of appetite: Increasing stress levels are often associated with a loss of appetite. This, when combined with fatigue, worsens the problem. As the brain is not at its best, it can lead to the development of forgetfulness and thereby causing further panic. Headache & giddiness: Headaches and giddiness accompany and further worsen the already tired brain. Loss of interest in pleasurable activities: As the mind becomes weak, so does the physical body; thereby resulting in a loss of interest in doing any of the pleasurable activities that one was interested in earlier. 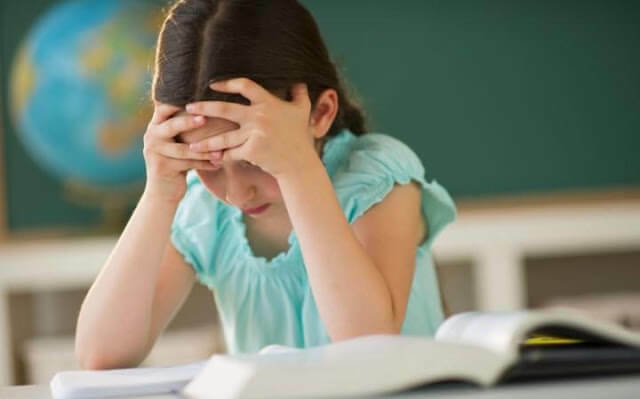 Having discussed stress identification, let us now shift focus to the ways of handling exam stress and keeping the stress level under check. The first and foremost step is to understand and accept that one is stressing out. Only when one does so, can he/she find a solution. Talking to a close friend or relative will help relieve the huge burden off of one’s shoulders. Another advantage of venting out the worries is that it helps to get a different perspective on the situation. The next important step would be to maintain a good diet. One must eat right. A proper combination of fruits and vegetables is a must in the diet. Only if the diet is taken care of, will the brain have the energy and stamina to sustain the necessary information it is being loaded with. The body needs sufficient sleep to rejuvenate and give a fresh start for a day. Eight hours of sleep is advised per day. Compromising on sleep will lead to poor performance the next day, hence one will not be able to perform to his/her best. This is one of the best methods of de-stressing oneself. When a person exercises, chemicals called “endorphins” are released into the system. These interact with brain receptors and cause a marked reduction in the stress levels. Each person is gifted with a particular talent and ability. Each person has a particular style or pattern. Accept that and avoid comparisons with co-students. Performing to one’s best ability is more important. For example, rather than trying to get in a certain number of revisions before the exam, concentrate on the quality of the effort that has been put in each of those revisions. As a final advice, on the night before the exam, remember to sleep early. Plan ahead. Pack all the required stationery and documents for the exam the previous day. In the exam hall, take a few deep breaths and say a silent prayer before commencing. This helps one to relax, thereby improving recall. More importantly, once the exam is over, try to avoid going through the books and redoing the exam paper. This will cause further anxiety. Moreover, it is not going to improve the performance as it is too late to go back and change the answers. So, relax and stay confident.